A look at detection timelines for hair, salive, urine, blood or other type of biological samples to determine the presence of barbiturates in the system. 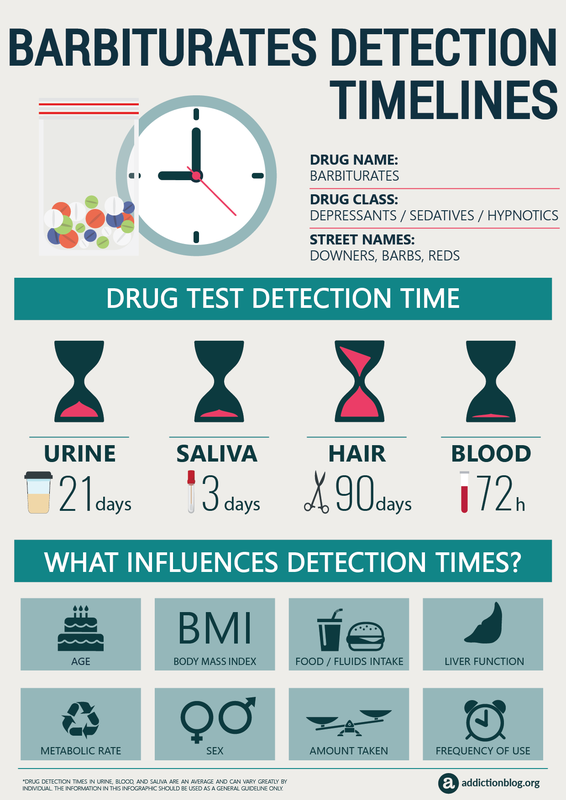 ARTICLE SUMMARY: This infographic outlines basic detection windows for barbituate drug testing in hair, blood, urine, and saliva samples. Did you know that the detection period for barbiturates during a drug test varies greatly? Those that are not chronic users might pass a urine drug test 3 weeks after last use, but a regular user will test positive for up to 2 months after last use! The test specimen, individual, and drug tested are all important variables to consider when evaluating drug test results. Urine: Urine is the most common sample type used for drug testing. A urinalysis will show the presence of barbiturates for 1 day – 3 weeks. Hair: Hair testing is used to determine barbiturates use over the longer term. A hair test will show barbiturate presence for 90 days. Blood: A blood drug test may be used to determine amounts of barbiturates the system at that very moment. The usual detection window of barbiturates is between 1 – 3 days. *Drug detection times in urine, blood, and saliva are an average and can vary greatly by individual. The information in this infographic should be used as a general guideline only. If you still have any questions on drug testing and detection timelines, download our free e-book The Definitive Guide To Drug Testing. Do you still have questions about drug testing for barbituates. Please post your concerns about barbiturates detection and timelines in the comments section at the end of the page. All comments are welcomed and appreciated. We will try our best to respond to your legitimate queries with a personal and prompt reply. NCBI: Drug use and interpersonal violence. Barbiturates detected in homicide victims. NCBI: Identification and differentiation of barbiturates, other sedative-hypnotics and their metabolites in urine integrated in a general screening procedure using computerized gas chromatography-mass spectrometry.